What’s kasha, you ask? Well, it’s something that’s been sitting around in a jar in my pantry for far too long. For a more illuminating answer, kasha is made from crushed, roasted buckwheat grains (AKA buckwheat groats). I buy it in the bulk aisle at WF. If you have plain buckwheat, you can essentially make your own kasha by toasting the grains in a dry skillet. The upcoming move puts me in a “use it up or throw it out” mood, and I don’t like throwing away food, so I headed to the internet for some recipe ideas. 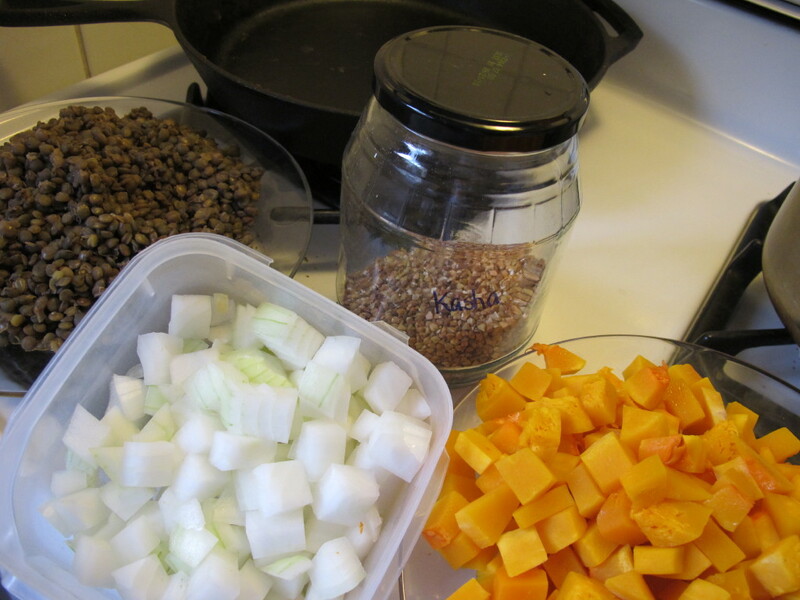 In the process, I learned a thing or two about buckwheat, and I’ll be keeping this food in my kitchen arsenal. Did you know that you can eat kasha raw? I crunched some grains while I was cooking and added a bit to my granola the next morning. Searching for inspiration, I found many interesting breakfast-y recipes, but I needed something for dinner. In the end, I used Meghan’s Buckwheat Sweet Potato Burgers as the inspiration for my creation. 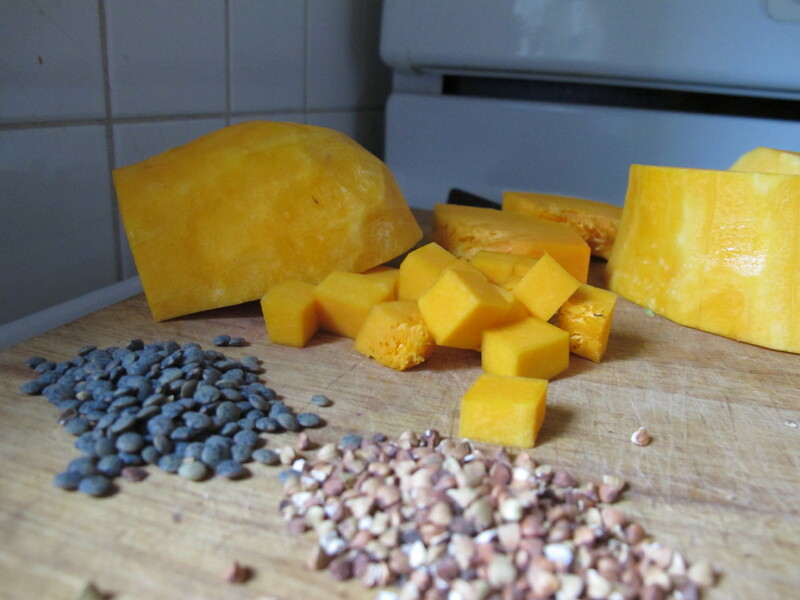 Peel and dice squash or sweet potato and steam until just tender. Place steamed squash in a large bowl and pour the balsamic vinegar over the warm squash. Toss to coat. In the same [now empty] pan you used for steaming the squash, cover the lentils with water (use enough water so there’s an inch above the dry lentils). Bring to a boil, and then simmer for 20-30 minutes. You want them tender with just a bit of bite, not mushy, so start checking after 20 minutes. Drain the lentils, reserving the cooking liquid. Add the lentils to the bowl with the squash, and sprinkle 1/4 t. salt over the lentils. Add enough water to the reserved lentil cooking liquid for a total of three cups. Bring this to a boil, add the kasha and 1/2 t. salt, cover, and simmer until the liquid is absorbed, 10-15 minutes. While the lentils and/or kasha simmer, saute the onions in some olive oil. After 10-15 minutes, add the cabbage to the onions with a bit more olive oil, and saute 5 minutes, or until the cabbage is just tender. Mix 1/3 cup almond butter, 2 T. soy sauce, and 1/3-1/2 cup water to make a nice, thick sauce. 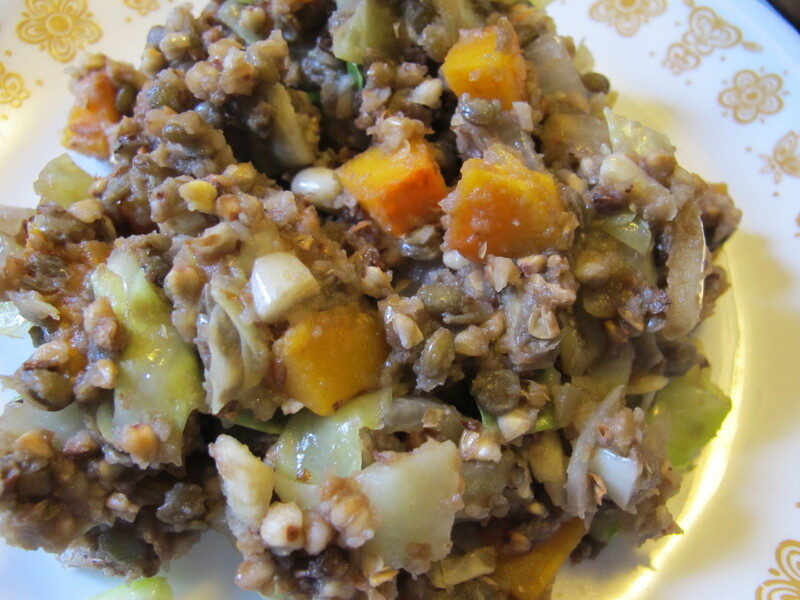 Once the kasha is cooked, combine the grain, lentils, squash, onions, and cabbage. If either your original pan or bowl are large enough, use this and avoid another dirty dish! Serve warm with a spoonful of the almond butter sauce on top. *The last of our winter squash 2011 harvest. **The balsamic was a last minute idea, and I wasn’t sure how it would work. I used our favorite balsamic, which is quite sweet and has relatively low acidity. I wouldn’t recommend just any balsamic here. This entry was posted in Food, Recipes and tagged cooking, vegetarian recipes. Bookmark the permalink. I’ve never heard of this, but it looks great- thanks for sharing!